The Tailgate is back! After an incredibly successful event last year, we are excited to announce the return of the Lovin’ Spoonfuls Ultimate Tailgate Party! 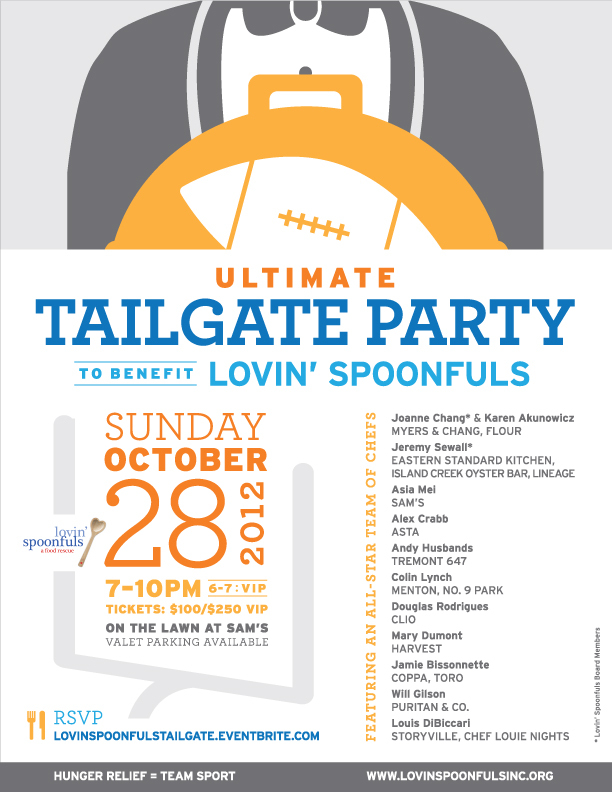 The second annual Tailgate benefiting Lovin’ Spoonfuls will take place on Sunday evening, October 28, overlooking Boston’s scenic waterfront at Sam’s. The event features 12 of Boston’s “MVP” chefs cooking high-end versions of their favorite tailgate food, as well as signature cocktails, a live auction, entertainment and much more. The theme of the event resonates with the Lovin’ Spoonfuls mission: combatting hunger is a team sport! Last year’s Tailgate event allowed the ‘Spoonfuls team to put another truck on the road, doubling our ability to pick up and drop off rescued food, and this year’s event aims to do the same. Buy your tickets here! We hope to see you there!